Analysis: Houston's tight ends were once again a minimal part of the offense, even with the wide receiver group depleted by injury. This was the sixth time in 14 games that Griffin has been targeted one or fewer times and the ninth time with one or fewer receptions. Analysis: Griffin fell back to earth this week after he amassed a season-high 80 yards in Week 14. If there's one Houston tight end to consider, it's Griffin based on his playing time and being the position group's target leader, but the Texans' passing attack clearly favors the wide receivers. Griffin has been targeted two or fewer times in six of 12 games played. Analysis: Griffin came just one catch shy of his season high while setting a new mark for yards in the contest. It was just the third time all year the 28-year-old has caught more than two passes in a game. He'll look to keep rolling on the road against the Jets in Week 15. Analysis: Griffin had his best game since returning from an illness, but his production has been too spotty overall. He's the best bet for a Texans tight end, but with no teams on byes Week 13 and beyond, fantasy owners should find better options. Griffin (illness) caught one of two targets for 13 yards in Sunday's 19-17 win over the Broncos. Griffin (illness) was a full participant at Wednesday's practice. Analysis: The full session supports coach Bill O'Brien's expectation that Griffin will return to action Sunday in Denver. Will Fuller's (knee) season-ending ACL tear briefly created the potential for an uptick in target volume, but Houston quickly filled the void by trading for Demaryius Thomas. What's more, rookie tight end Jordan Thomas made a strong impression with a pair of touchdown receptions in last week's 42-23 win over the Dolphins, making his case to stay involved moving forward. Coach Bill O'Brien relayed Wednesday that Griffin (illness) is in line to return to action Sunday against the Broncos, Deepi Sidhu of the Texans' official site reports. 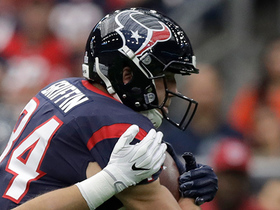 Analysis: Griffin missed the Texans' last two games, but it looks like he's on track to re-enter the team's tight-end mix in Week 9. 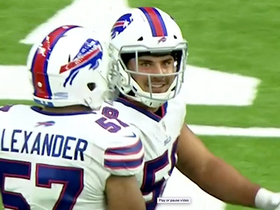 While Griffin sat out the Week 8 win over the Dolphins, Jordan Thomas stepped in as the starter and hauled in all four of his targets for 29 yards and two scores. Thomas' solid outing probably means it's no lock that Griffin will fall into a high-volume role upon his return to action. 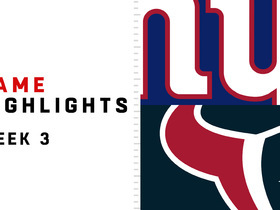 Through the Texans' first six contests, Griffin corralled 10 of 25 targets for 140 yards. Griffin (illness) has been ruled out for Thursday's game against the Dolphins. Analysis: Griffin's absence for the second straight week will allow Jordan Akins and Jordan Thomas to share snaps at tight end once again. Neither of the two rookies factored much into the passing game in the Week 7 win over the Jaguars, as the duo combined to draw one target. Griffin (illness) did not participate at Tuesday's walkthrough. Analysis: Griffin was inactive last week and has sat out both walkthroughs to start this week. The 28-year-old will likely need to showcase significant progress at Wednesday's practice, or Jordan Akins and Jordan Thomas will again be asked to fill in at tight end Thursday against the Dolphins. Griffin (illness) did not practice Monday. Analysis: Griffin was inactive last week and starts Week 8 as a question mark for Thursday's game against Miami. If he can't go, Jordan Akins and Jordan Thomas will fill in, though neither have been major targets for quarterback Deshaun Watson in 2018. Griffin won't play Sunday against the Jaguars due to an illness. Analysis: With Griffin out this week, Jordan Akins and Jordan Thomas will lead the way at tight end for the Texans on Sunday. 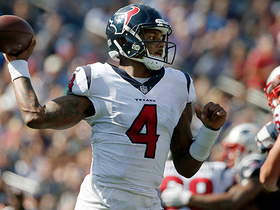 Neither of the two rookies projects to have a significant role in the Houston passing attack. Griffin was targeted five times but caught none of them in Sunday's 20-13 win over the Bills. Griffin (toe) doesn't have a designation for Sunday's contest against the Bills. Analysis: Limited in practice all week by a toe injury, Griffin has nonetheless been cleared to play Week 6. 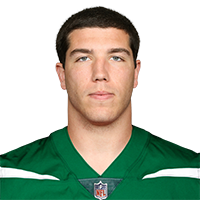 On the heels of a season-best 6-65-0 showing on nine targets last Sunday against the Cowboys, he'll look to keep up the pace versus a Buffalo defense that has yielded 7.0 YPT and two touchdowns to tight ends this season. Griffin was a limited participant at Wednesday's practice due to a toe injury. Analysis: Griffin is fresh off his best game of the season, so it's a bit disappointing to see him listed on the injury report. The Texans haven't elaborated on the severity of the toe injury, so we'll have to wait and see how this plays out. Should Griffin practice in full later this week, it's expected he'd be ready to go for Sunday's game. Griffin caught six of nine targets for 65 yards in Sunday's 19-16 overtime win over the Cowboys. 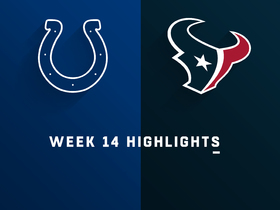 Griffin caught his lone target for 12 yards in Houston's Week 4 overtime win over Indianapolis on Sunday. Analysis: Griffin, who led Houston's tight ends in targets last week, had just one target Sunday for the second time this season. The position group was targeted just four times in 42 pass attempts. Griffin caught two of four targets for 44 yards in a Week 3 loss to the Giants. Analysis: Griffin's 32-yard catch was one of Houston's seven plays that gained 20-plus yards and his longest of the season. However, once again, targets were spread out among Houston's tight ends, making it hard for Griffin to stand out as a weekly fantasy play. Jordan Thomas (two targets) and Jordan Akins (one) also received attention from quarterback Deshaun Watson. Griffin (hip) was a full participant in Wednesday's practice. Analysis: Griffin was limited in practice to begin the week, but seems to have fully recovered from his hip injury. 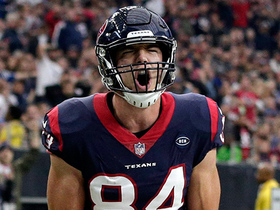 Despite being listed as the Texans' starting tight end, Griffin has shared a substantial amount of targets with fellow tight ends Jordan Akins and Jordan Thomas. Targets could once again be divided between Houston's three tight ends in Sunday's matchup against the Giants. Griffin was a limited participant in Wednesday's practice due to a hip injury. Analysis: Griffin likely picked up the injury in Sunday's 20-17 loss to the Titans, during which he hauled in his lone target for 19 yards. The starting tight end will have two more practices to prove his health ahead of the Texans' Week 3 matchup with the Giants. Griffin caught his lone target for 19 yards in Sunday's 20-17 loss to the Titans in Week 2. Analysis: After Griffin was shut out in five targets in Week 1, he made his first catch of the season Sunday. Griffin is the starting tight end, but finds himself sharing playing time with Jordan Akins and Jordan Thomas, which serves to dilute the targets of all three. Griffin did not catch any of his five targets in Sunday's 27-20 loss to the Patriots in Week 1. Analysis: Griffin opened the game as the starting tight end, but he and quarterback Deshaun Watson failed to get in sync, including on four targets inside the 20. It could have been Griffin cutting off his routes or Watson misfiring, as New England's defense pressured the quarterback most of the day. While Griffin was shut out for the day, backup tight ends Jordan Akins (two catches, two targets, 11 yards) and Jordan Thomas (one catch, two targets, 27 yards) were able to handle the ball Sunday. 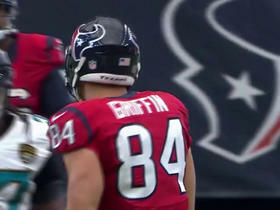 Griffin secured two of four targets for 29 yards in the Texans' 16-13 preseason win over the 49ers on Saturday. Griffin is the top tight end on the depth chart as the Texans enter training camp, Aaron Wilson of the Houston Chronicle reports. Houston drafted a pair of tight ends to join Griffin, using a third-round selection on Jordan Akins and a sixth-round pick on Jordan Thomas, Deepi Sidhu of the team's official website reports. Griffin (concussion) was placed on injured reserve Friday, Adam Schefter of ESPN reports. Analysis: Texans tight ends have been plagued by concussions all season. With C.J. Fiedorowicz ready to play for the first time since Week 1, the team swapped him for Griffin on the 53-man roster due to the latter's own head injury. For the rest of the season, Houston will roll with Fiedorowicz and Stephen Anderson at tight end. Griffin remains under the NFL concussion protocol and is expected to miss Sunday's game against the Rams, Aaron Wilson of the Houston Chronicle reports. Analysis: Griffin will need to pass baseline neurological testing and practice without symptoms before he can be medically cleared to play. Absent Griffin, the Texans are hoping to get C.J. Fiedorowicz (concussion) for Sunday's game against the Rams. If not, the tight end position falls to Stephen Anderson. Griffin (concussion) is expected to miss Sunday's game against the Rams, the Houston Chronicle reports. Analysis: Supporting such a notion is that Griffin did not practice Wednesday, but fortunately for the Texans, fellow tight end C.J. Fiedorowicz (concussion) is on track to return to action this week, Deepi Sidhu of the team's official site reports. Griffin was forced out of Sunday's game against the Colts with a concussion. Analysis: Prior to his exit, Griffin had not caught any passes in Sunday's contest. Looking ahead, Griffin's Week 10 status looks cloudy, while fellow tight end C.J. Fiedorowicz (concussion) appears on track to return to action from injured reserve next week. Griffin (hip) no longer carries an injury designation for Sunday's game against the Colts after practicing fully Friday. Analysis: We suppose that Griffin could serve as a safety blanket for QB Tom Savage, who will start Sunday's game in the wake of Deshaun Watson's season-ending injury. Even if Griffin does play a key part in the Texans offense in Week 9, however, that could be a short-lived situation, with fellow TE C.J. Fiedorowicz on track to return from injured reserve in Week 10. Griffin (hip) was a limited participant in Thursday's practice. Analysis: With back-to-back limited practices to kick off Week 9 preparations, Griffin seems on track to play Sunday against the Colts, despite nursing the injury. Though he's in line to start at tight end that contest, Griffin is expected to settle into a more limited backup role thereafter, as C.J. Fiedorowicz (concussion) is on track to return from injured reserve in Week 10. Griffin was limited for Wednesday's practice. 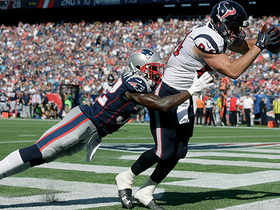 Houston Texans tight end Ryan Griffin speeds past defenders on a 47-yard catch and run. 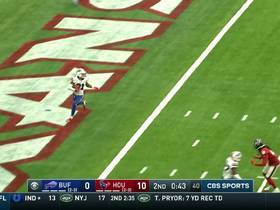 Houston Texans quarterback Deshaun Watson throws to tight end Ryan Griffin for a 21-yard completion. 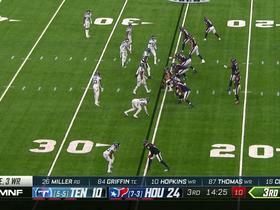 Houston Texans QB Tom Savage finds tight end Ryan Griffin for a 23-yard gain.